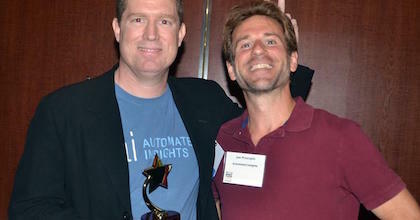 Automated Insights Chief Product Officer Joe Procopio (right, with Automated Insights CEO Robbie Allen) talks to Taking The Charge about automated sports game reports. Taking The Charge Podcast Episode 164: We talk about hoops off the court this week, addressing the possible host countries of the 2016 Olympic Qualifying Tournaments as well as the new proposal for the Basketball Champions League. The interview of the week continues with the off-court theme as Joe Procopio comes on to talk about Automated Insights. Episode 164: We start off with FIBA talk – possible 2016 OQT bidders as well as Basketball Champions League. Then we talk about automated game reports with Joe Procopio – Chief Product Officer from Automated Insights.